Stable isotope labeled peptides (SIL peptides), also known as heavy peptides, are peptides formed by amino acids with substitution of certain atoms. Thus, 12C can be replaced by 13C, 14N by 15N and 1H by 2H. Stable isotope labelled peptides demonstrate identical chemical and physical properties and behave in the same manner as non-labeled peptides, they only differ by mass. Thanks to this delta mass, SIL peptides are useful in quantitative proteomics for relative protein quantification ICAT (Isotope Coded Affnity Tags) and iTRAQ (isobaric Tags for Relative and Absolute Quantifcation) and absolute protein quantification applications (MRM (Multiple Reaction Monitoring) and AQUA (Absolute QUAntification of proteins)), NMR studies and others mass spectrometry techniques based on their well-defined increase in molecular weight compared to the native peptide of interest. Individual stable isotope labelled peptides including long or complex sequences (c.f. table 1). Synthesis scale: starting from 1 mg, 2 mg, 5 mg and over. Purity rate >80%, >90%, >95%, >97%, >98%, >99%. 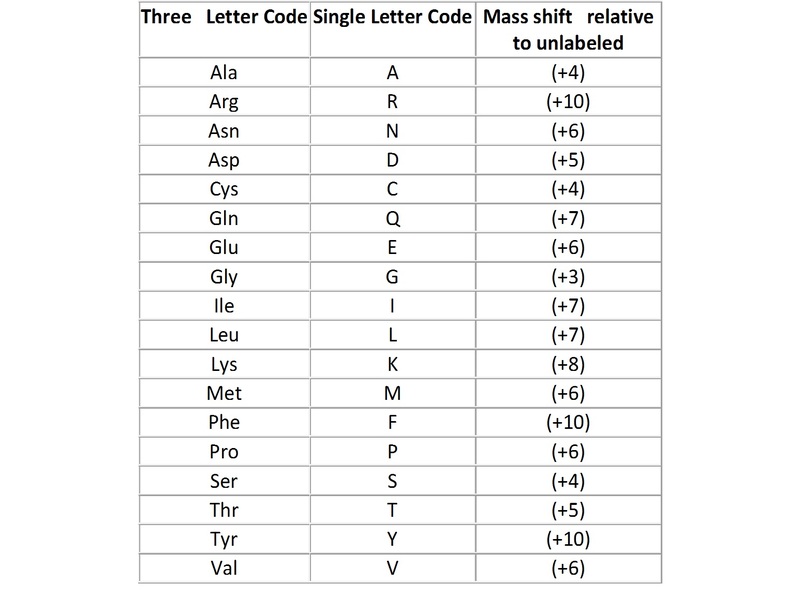 Most common labelling are N-ter or C-ter K(13C 15N) or R(13C 15N). Other positions or amino acids can be considered. Our 10 days express service is applicable on the synthesis of isotope labeled peptides, contact us to check if your peptides are eligible.